I want to send one lucky winner to a food cart pod with a great atmosphere and a good vibe. If you show up at the right time you will also hear some live music. So go with me, if you will, to Alberta and 23rd, to The Cheese Plate. The owners Nick and Carina are so sweet and they want nothing more than for you to have an great experience. They have these beautiful cheese plates with house made crackers. After you order they will bring the plate out to you and they will explain where everyone of the Oregon cheeses came from and a little about them. Seriously, it’s like a fancy restaurant except better. You are outside where you can enjoy some great weather, live music and lots of great people watching. If you are vegan, don’t worry, they have got you covered. 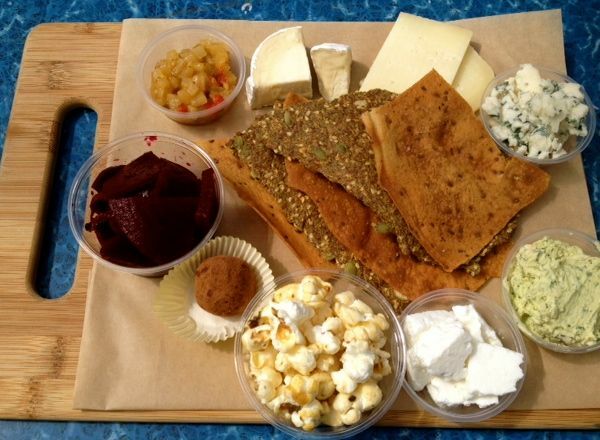 One lucky winner will win this Cheese Lovers Plate. While you are there check out the rest of the menu, they also serve up some pretty creative grilled cheese sandwiches. Their menu changes with the seasons, so what I ate you might not see on your plate, but I promise you won’t be disappointed. Read about a previous visit here. Like my Facebook page, that way you will keep up with any of my giveaways (I have 2 cool ones coming) and other exciting things happening. Like The Cheese Plates Facebook, because you don’t want to miss any of the fun activities. They had goats one day. Comment below telling how much you like cheese. Also tell me what you did and I will enter you to win. One entry per thing you do. The giveaway will run through mid day Sunday, June 16th 2pm. I will announce the winner later on June 16. I love cheese! I’ve considered going vegan but the thought of no cheese is depressing! My all time favorite foods are mac and cheese (home made) and grilled cheese sandwiches! Would love to broaden my cheese knowledge too! I already like you on facebook and I “liked” the cheese plate just now! So, I discovered cheese when I lived in France ten years ago. I have spent years hunting down cheeses here that satisfy my craving. I found an aged camembert that literally brought tears to my eyes. Happily, a lot of local cheeses are AMAZING. The Juniper Grove Redmondo comes to mind. Recently found a buffalo milk cheese at New Seasons that gives me goosebumps. Needless to say, I adore cheese. So much so that I am liking both your pages! Of course I liked both pages because I am obsessed with the Cheese Plate! i love cheese so much i worked at a cheese store, you can almost call me a cheese expert. I just liked your fb page too! I LOVE cheese! Chevre, fresh mozz, and brie are my favorites – but there are so many otehr delicious choices! I already like the Cheese Plate fb page and I haven’t yet been to the cart! I’d love to get to try it – thank you! Mmmmm cheeeeeezzzee. Ghgggaaarrghh (homer simpson drool). I already liked your FB page, and liked the Cheese Plate page now too. I eat cheese on a daily basis! The stronger the better! I love cheese. All cheeses! Now I know what I’ll have for breakfast. I liked your fb and the Cheese Plate’s fb page. I’m pretty sure cheese is in my DNA 🙂 I liked the Cheese Plate and your page, too. Thank you! Cheese I love Cheese on every thing!! Can’t wait to try the Cheese Plate!! I’m fan of Eating my way thru Portland and a fan of The Cheese plate!! cheese, glorious cheese! Love me some goat, sheep and cow in that order. or you can order the vegan cheese plate. I love that they have that option. Being what I eat (when I’m not being John Malkovch), I am cheese and am cheesy. Goat cheese specifically is my favorite of late. I adore raw cheese, with names like Diablo and Mr. Habanero. Stinky cheese is all right with me. The sharper and whiter and Vermontier the aged cheddar, the better. By the way, I liked your Eating My Way through Portland FB page, and I liked the Cheese Plate Plates FB page. Cheese seems to love me back, the way it always melts in my mouth. Yeah baby. When I was preggers and didn’t want to take the chance, I’d often cry over my inability to eat stinky soft cheeses from exotic foreign lands. I love cheese. All kinds of cheese. And trying new cheese. I liked your FB page and The Cheese Plates FB page because I LOVE CHEESE! I love it by itself, on crackers, on sandwiches and in fondue. I love jack cheese in burritos, freshly grated parmesan on pasta, and warm brie with carrots. Cheese is one of the foods that I crave and I eat it almost every day. Cheese . . . it makes the world go around. I love cheese and it loves me right back. I love cheese even more than I love bacon. It must be genetic – my mom thinks a good hunk of cheddar (and maybe an apple or something) constitutes a full meal. i liked your page and the cheese plate’s page. and saw there that the alberta pod was hit by cord thieves yet again. jerks. anyhoo, i love cheese almost as much as i love my momma. They were hit again?!?!??!? Are you kidding me?? UGH!! Let’s show those vandals they can’t stop our food cart love. LOVE cheese. When I tried going dairy free for one money, I missed cheese a lot. My favorite is smoked gouda, goat cheese and feta a close second and third!